Step 2: Then update that property as often as you like! *If you have more than one property, then you can add multiple properties and update them individually! Our goal is to have 100 active properties our first year. 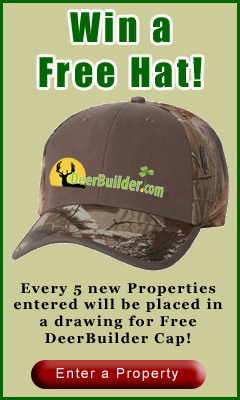 To encourage participation, we will be choosing one property each week and sending the lucky winner a DeerBuilder Cap or T-shirt! And one last thing...No Property or project is too small, too large, or too basic!